I skipped an entire console generation, for many reasons not worth going into here. I never bought a GameCube, PlayStation 2, Xbox or Dreamcast; nor was I interested in a PSP or DS. I was a starving college senior and graduate during the so-called Sixth Generation, and I figured I had better things to do with my life than play video games any more. All that changed when Nintendo came out with the Wii. Truthfully, I had minimal interest in Wii when it launched. Yeah, that’s great, it’s a $200 bowling simulator. How fun. I didn’t know anyone who owned one, and I wasn’t convinced at the time that motion control was fun or interesting. (I’m still not.) But what changed my mind, brought me back into the fold and reignited the passion for games that still burns brightly in me today, was not a control scheme, or any game in particular. It was the Wii Virtual Console. Years earlier, I’d heard a colleague talk about Nintendo’s next console. It was to be called the “Nintendo Revolution”, and the big selling point that caught my attention was its supposed ability to play most or all NES, Super NES and Nintendo 64 games. At the time, I pictured in my mind a system that much more closely resembles the RetroN 4 than the actual Wii; but it was a thrilling concept to me. It would allow me to fix one of the biggest mistakes of my life: constantly broke in my final couple years of college, I sold my entire collection of NES, N64 and Virtual Boy games and consoles, including my top-loader NES. I’d kept my Game Boy Color and Super NES and a few games for each, but other than that, I had literally cashed out of gaming for good. Or so I thought. This, I figured, would be enough to get me back in the fold. Aside from playing a little bit of Madden NFL 2004 and Grand Theft Auto III on my roommate’s PS2, I didn’t really have any interest in modern games at the time. Maybe the Wii would get me back into things. I didn’t bother buying a Wii at launch, and I didn’t really have the money (or time) for games until a few years later. Finally, after days of research online, I took the plunge. It was February 2009, and the Wii had once again been a huge holiday seller. They were impossible to find. Every Best Buy, Target and GameStop I checked in the Dallas area had none left. I managed to snag the very last one at a Walmart late one night. Taking it home, I set it up and tried a little bit of Wii Sports. Fun, but not what I was here for. Then I got my first taste of Virtual Console. What a concept! This was what I’d waited my entire life for: a digital games service that would give me access to all the classics I’d loved as a kid, without the hassle of keeping track of all those cartridges and keeping them clean. I didn’t have to stack three separate consoles awkwardly around one TV and keep their controller cords from tangling. Everything I wanted, in one place! And so many great games! Naturally, the first title I downloaded was my favorite game, The Legend of Zelda: Ocarina of Time. I finished it in a couple of days. Then I downloaded another game. And another. Soon, I’d acquired every game available on the service that I’d owned previously. I figured it was a good chance to start playing some games I’d never tried before. I started with Super Mario RPG. I had never played an RPG title before. This could prove interesting. To say I loved it was an understatement. It was a gateway drug. I wanted more. Suddenly, an entire genre opened up before me. I immediately went straight to Final Fantasy (which was probably not a good idea for a beginner), then Final Fantasy IV. Then the WiiWare midquel, Final Fantasy IV: The After Years. And so on. Chrono Trigger. Final Fantasy VI. Paper Mario. I also got to experience and enjoy all the consoles I missed. Unapologetic Nintendo fanboys like myself skipped over the Genesis and never knew anyone who owned a Master System. I tried some of SEGA’s finest myself and loved those, too. Then TurboGrafx-16, which I’d heard of but never actually seen in action. Then Neo-Geo, the system that was so legendary when I was in middle school, I suspected it didn’t really exist. It does, and its games are awesome. (I never did try any of the Commodore 64 games released for the service, and they’ve all been removed now, but I do commend Nintendo for bringing a handful of them to V.C.) Even a handful of arcade games got the treatment. It was classic gaming bliss! Nearly two years passed before I bought my first on-disc game for Wii, and it wasn’t even a “real” Wii game: Super Mario All-Stars Limited Edition, which was literally an unmodified Super NES game slapped on a Wii disc. It would be another year — three years after buying the Wii console — before I purchased my very first proper Wii game. It was, of course, New Super Mario Bros. Wii. Since then, I’ve upgraded to a Wii U, bought many more Wii and Wii U games, and added a 3DS to my collection (that, too, with the primary objective of buying classic Game Boy games via Virtual Console). 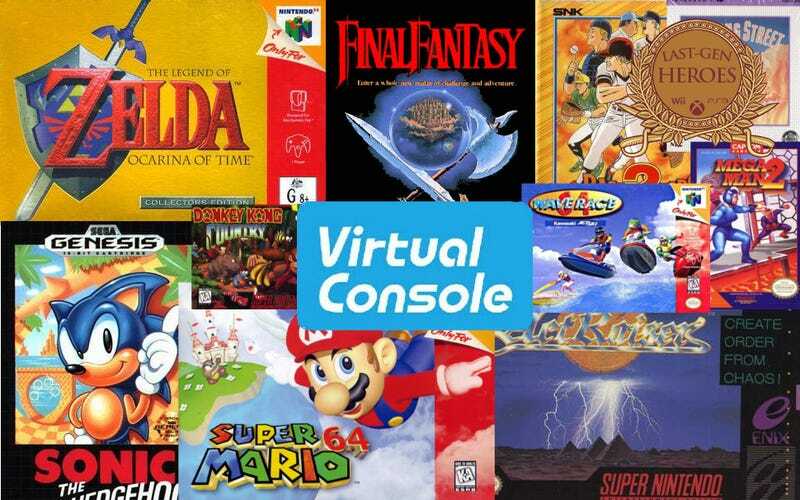 But the vast majority of the games I own today are Virtual Console titles — 127 and growing. Sony and Microsoft later added similar services to their respective platforms, via PlayStation Network and Xbox Live Arcade. Thanks to these and Virtual Console, gamers today can own huge libraries from legacy consoles without spending tens of thousands of dollars. Don’t get me wrong — there’s nothing like owning the genuine article. But proper emulation like this keeps these classics alive for veterans and newcomers alike, while avoiding the pitfalls of unauthorized PC downloads. I’ll admit the pricing of some of these games — particularly NES titles — is a bit on the high side, but I don’t mind supporting publishers who are smart enough to make sure some of their best games aren’t lost forever once the last cartridges and discs have corroded.